Here are thousands of free Sudoku puzzles to print. 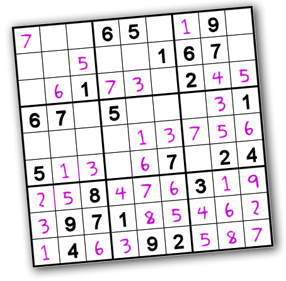 Each booklet of printable Sudoku contains eight puzzles, instructions, hints and answers. If you like these puzzles, check out my other puzzles too! These are the easiest sudoku puzzles I offer. If you are new to Sudoku puzzles, try some of these first. These puzzles are midway between my Easy and Intermediate puzzles, and contain just a few redundant clues. These sudoku puzzles can be solved using simple logic, but unlike the Easy & Novice puzzles, they contain no redundant clues. These puzzles may contain a few squares whose solution is not immediately obvious. Tough sudoku require more advanced logic such as X-Wing and Swordfish (click here to read more about these advanced sudoku strategies). I provide an extra scratch area on these puzzles for working out the solution. Super Tough puzzles may require a little guesswork, or even more advanced strategies (click here to read about advanced sudoku strategy) to complete the puzzle. I provide an extra scratch area on these puzzles for working out the solution. Insane sudoku are the hardest sudoku I offer. They cannot be solved without making guesses. I provide an extra scratch area on these puzzles for working out the solution, but it won't be much help! My printable puzzles contain a page of hints in addition to a page of answers. The hints are puzzle grids that contain numbers showing the order in which the squares were solved by my computer. Although this is not necessarily the order you would solve the puzzle, it's probably in the neighborhood.